This lovely garden plant grows very well in shady gardens, as well as in containers (hanging baskets), which is probably the most innovative way to optimize limited space in a 21st century garden. Asystasia varia is an erect to slightly creeping, herbaceous perennial, growing to a height of 10-600 mm. 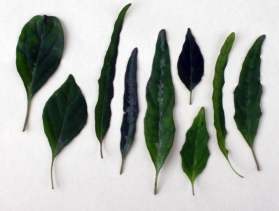 The glossy green leaves are variable in shape and size, sometimes marked with a seasonal silvery colour variation, which appears along the midrib and lateral veins. The plant bears between 2-10 single, lilac-mauve flowers and blooms from October-June in the southern hemisphere. Despite its sporadic distribution, Asystasia varia does not seem to be threatened at all as it is also found in some declared forest reserves. Asystasia varia is a forest herb endemic (only found) in South Africa , and is currently only known to occur naturally in KwaZulu-Natal and Eastern Cape. Plants grow in deep shade, forming an extensive forest floor population. Owing to their restricted natural habitat, plants seem to be more suited to both the temperate and the subtropical environments. Cultivation in frosty areas should be avoided; however, this is open to further experimentation and evaluation. N.E. Brown, as quoted by Edwards,1988 formally described Asystasia varia from plants collected by John Medley Wood at Entumeni Forest. Brown (according to Edwards 1988) highlighted the horticultural potential of A. varia as an ornamental plant but the species then never really became popular. It was speculated that perhaps part of the dilemma in popularizing these plants could be that, under cultivation, plants are more susceptible to damping off and are easily attacked by mealy bugs. The genus Asystasia comprises mainly herbs or weak shrublets and there are approximately 70 species in the world, of which eightare currently known to occur in southern Africa . The genus distribution extends throughout the tropical and subtropical areas of Africa, Asia and Australia. The species name "varia" refers to the variety of its leaf shapes. 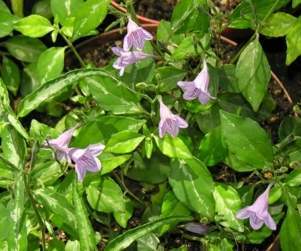 See Asystasia gangetica for more information about the origin of the genus name. The flower adaptation, as theoretical reports indicate (Edwards 1988), is linked with the lepidopteron (month and butterflies) pollination syndrome. There are currently no records of any known pollinators of these plants. Apart from the enormous horticultural uses both as container and garden plants, there are no records of any traditional/cultural uses known at this stage. Plants are readily and easily propagated from stem cuttings or seeds (if propagated from seeds, some variation of progeny can be expected). In cultivation, plants perform very well in full shade and they flower throughout the year but not in late winter (July and August in the southern hemisphere). Grow them in moist, well-aerated soil, as plants are naturally forest dwellers, with some added compost. Mulch the flowerbed with preferably shredded indigenous wood chips or disease-free leaf mould. Light pruning of A. varia invigorates plants and stimulates an attractive, bushy growth. Plants are suited to herbaceous borders or can be grown on their own for showy, shady gardens. 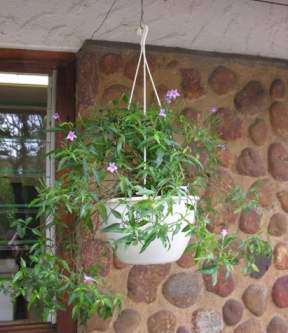 They grow extremely well in containers, especially hanging baskets (currently under experimentation in the Lowveld National Botanical Garden), and this is the best way of growing them in a small garden. Plants are vulnerable to mealy bug attacks, but there are plenty of remedies on the market to control these pests. Edwards,T.J. & Getliffe Norris, F.M. 1993. Asystasia gangetica. 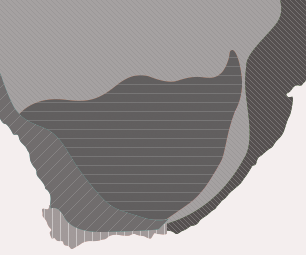 The Flowering Plants of Africa 52: t. 2076. Edwards, T.J. 1988. Asystasia varia . The Flowering Plants of Africa 50: t. 1976. Ross, J.H. 1972. The Flora of Natal . Memoirs of the Botanical Survey of South Africa No. 39. Welman, W.G. 2003. Acanthaceae . In: G. Germishuizen & N.L. Meyers (eds), Plants of southern Africa : an annotated checklist. Strelitzia 14: 92 - 106. Pretoria . National Botanitcal Institute.